southern Europe and North Africa. 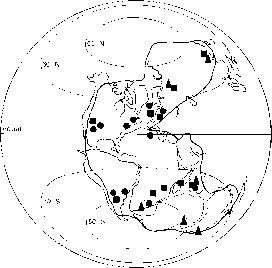 Nevertheless, there is strong evidence that tetrapods could disperse widely because faunas of continental tetrapods were similar worldwide. 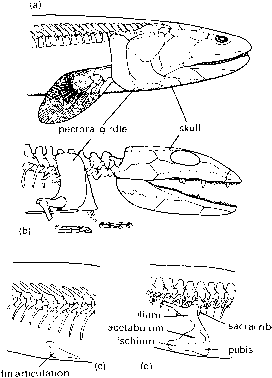 For example, the first faunas of the earliest Triassic were dominated by the dicynodont Ly-strosaurus, and included other elements such as small therocephalians and cynodonts, the early archosaur Proterosuchus (see below), prolacertiforms and pro-colophonids. These animals were found first in the Karoo Basin of South Africa (see p. 131), but similar faunas were later found in Antarctica, India, South America, China and Russia, evidence for a global supercontinent at the time (see p. 25). Triassic climates were warm, with much less variation from the poles to the equator than exists today. There is no evidence for polar ice-caps, and the north and south poles both lay over oceans at the time. During the Triassic, there was apparently a broad climatic shift, at least in terms of the reptile-bearing rock formations, from warm and moist to hot and dry (Tucker and Benton, 1982). This may have been caused partly by a northwards drift of southern reptile-bearing sites into the tropical climatic belt. The climatic change caused a major turnover in floras. During the earlier part of the Triassic, floras in the southern hemisphere were dominated by the seed fern Dicroidium, a shrubby plant with broad leaves. These floras disappeared in the Late Triassic, and they were replaced by northern-style conifer-dominated floras, better adapted to dry climatic conditions. The floral turnover was matched by a major faunal turnover, and the dominant herbivores died out, to be replaced in time by the first herbivorous dinosaurs (see pp. 159-61).